Allen Park — Reggie Bush grew up in Los Angeles and played at USC. His previous NFL homes have been New Orleans and Miami. So, he's gone from Hollywood to Bourbon Street to South Beach to — Detroit. Cue the Debbie Downer music? "I came here to work," he said Wednesday after the second of three OTA sessions for the Lions this week. "I didn't come here to vacation. I came here to win championships, to win football games, and that's what I look forward to doing." Bush, as he will remind you, wasn't exiled to the Lions. He chose to be here, and he's not once regretted his decision. "Some guys have been asking me, 'How was Miami? How was South Beach,'" he said. "I tell them, you know, it's nice but if the football isn't right, it doesn't matter where you are at. If your work isn't right, you are not going to be happy. "As long as we take care of business here, this can be an amazing place. I think it has a lot to offer. I look forward to getting into that stadium and hearing those fans be as loud as ever." Besides playing in posh locations, Bush also has played on championship teams. He played for the national title at USC and has a Super Bowl ring from his days with the Saints. Does he see anything here that resembles a championship environment? "I see guys who are willing," he said. "I see guys that want to go out there and be great and they are putting in the work. It's just about doing the little things right. This is a league of all-stars. Everybody is talented. Everybody is fast, big and strong. "It comes down to focusing for four quarters every game and being able to finish games out." Bush, along with quarterback Matthew Stafford and receiver Nate Burleson, are fast emerging as the vocal leaders of the offense, if not the team. All three talked about seeing a different sense of seriousness about the team this offseason. "We're a little more focused," said Burleson, who is participating after offseason surgery to repair a broken leg. "Everybody understands, realistically, there is a window of time for everybody in here. Coaches see it, players see it. Whether you are old, young or a rookie, if things don't shape up in the direction we need them to, there's going to be changes. Burleson said the 4-12 slide last season was a wake-up call, and he's seeing the same "foam-at-the-mouth" attitude he saw before the 2011 season. "You always try to see the silver lining in things and I think (the losing) creates that hunger we didn't have last year," he said. "A couple of years ago we were just foaming at the mouth. We were constantly in an alley fight and we loved it. We relished those moments. "Last year, I didn't see that as much. We had glimpses of it, but having the 4-12, guys are back foaming at the mouth wanting to fight our way back to the top." 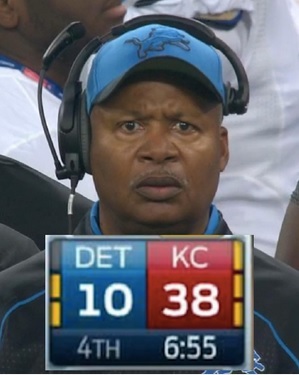 Stafford sees the same thing, but from a different motivational point of view. "Every season is a new season and you have to find something that's not in the past to motivate you; it's something looking forward," he said. "It's not whether or not we made the playoffs last year, it's striving to make them this year and giving yourself a chance to make that run. "That's the kind of stuff that motivates me. This is a whole new year and we're a whole new team. Let's move forward." The presence of Bush, his diverse skills and his championship pedigree, already is helping the Lions forget last season. After all, he got a steak named after him (at Birmingham's Hyde Park Prime Steakhouse) before he even put on a Lions uniform. "That was pretty cool," Bush said. "It kind of shows the type of impact I can have on the community here. The reception I've gotten from the fans here has been second to none. Talking to fans, not just here in Detroit but all over, they are always talking about how excited they are about the season, about having me here and getting a winning season. "I look forward to getting into that stadium and winning football games." I know this is probably the scotch talking, but when I read things like this I get really excited for this season. Last year, I remember not knowing what to expect, but this year, I expect the team to be good. I think they're going to surprise a lot of people. Not super bowl winning mind you, but I wouldn't be shocked by a 10 win season. Ya know, I kinda agree with you on this. Championship isnt a real possibility in my opinion. That doesnt mean this team cant be a good, solid team. And I think thats just their ceiling right there, fortunately and unfortunately. I do believe they will be a better team than last year. Im pretty excited for Reggie and what they can do with him. If he can fill the Best role perfectly, that should be great. That offense was very dangerous when Best was healthy. I'm firm believer that any team good enough to make the post-season can win the Superbowl.